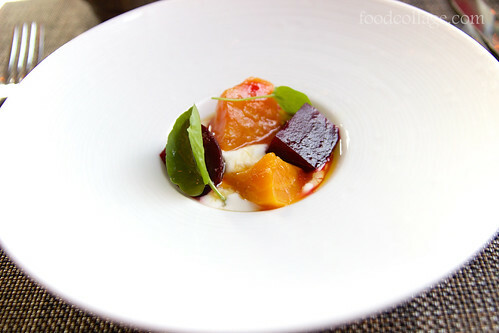 Last week my friend and I were treated to dinner at Habitat at the Fairmont Hotel, where Chef Francis Ward prepared eight courses for us to sample. My friend and I were both completely blown away by the phenomenal quality of the food and I thought I'd share a few photos here. Although every single course was fantastic, I must state for the record that the unbelievable melt-in-your-mouth tender duck breast was the best duck I have ever had in my life—bar none. 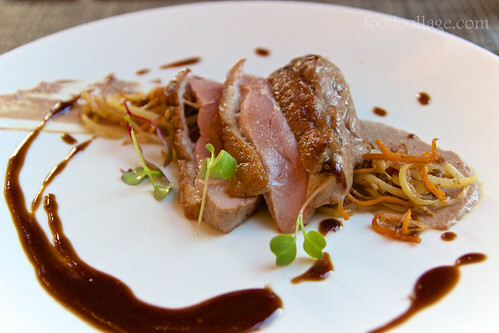 In fact, my friend doesn't usually eat duck, and she gobbled this up. 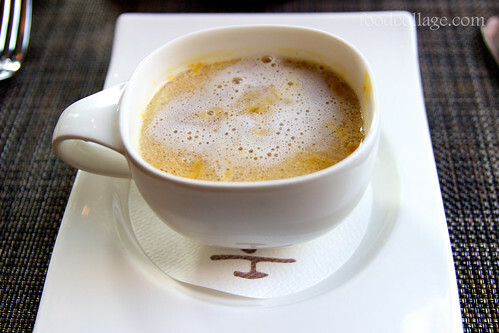 Two other standout courses that also deserve special mention are the salted caramel pumpkin soup and the sweet potato gnocchi. My understanding is that a new menu will be unveiled soon, and I'm confident that the new dishes will be just as fantastic! In addition to incredible food, the service was also top-notch. Our server was beyond attentive and we were visited by both managers and the chef to ensure our experience was nothing but perfect. For full disclosure, the meal was complimentary for a reason entirely unrelated to my status as a semi-anonymous, sometime food blogger; in fact, my friend was the one who made this dinner happen and Habitat had zero idea that I write this blog when the invitation was extended to us. Also, because this was a chef's tasting, the photos may not reflect full portions from the menu. Well, hello. It's been a while since I even logged in here, let alone post something to this lonely, abandoned space. What I can say? I've been busy. As in barely-got-time-to-breathe busy. My various hobbies took a backseat...or more like a hideout in the trunk. Hopefully I'll have a little time now to make a slow comeback. I have a year's worth of food adventures on the backlog, but rather than picking up where I left off, I thought I'd just start fresh and go back to the old stuff if I have time. And what better way to hit "reboot" on my blog with a unique event that R. and I just attended last night: The launch of Dinner Lab in Pittsburgh. Dinner Lab is an experimental dining concept that began in New Orleans (*swoon*) in 2012 and now spans across 33 cities across the USA. Each event features an up-and-coming chef testing out his/her specialty dishes and he/she will have the opportunity get feedback from diners to help hone his/her craft. 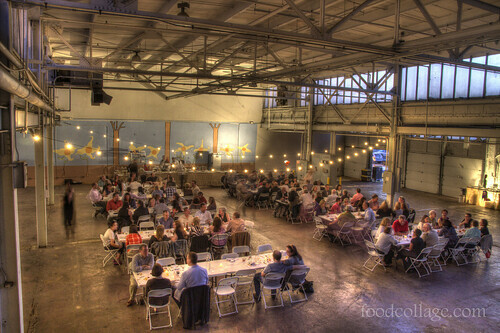 To attend, one must be a member of Dinner Lab ($125 annual fee for Pittsburgh) or be BFFs with one who may purchase up to four tickets to each event. Each dinner ranges from $50-$95 per ticket, and so far, the Pittsburgh events have sold out LIGHTNING FAST. The ticket price includes tax, gratuities, and alcohol, so no money is exchanged at the dinner itself—just show up with your ID and enjoy! The events are always set up with 60 seats at communal tables per seating, two seatings per evening. The venue varies each time and is only revealed one day prior to the event. About half the events will feature local chefs while the other half will be from all over the country. 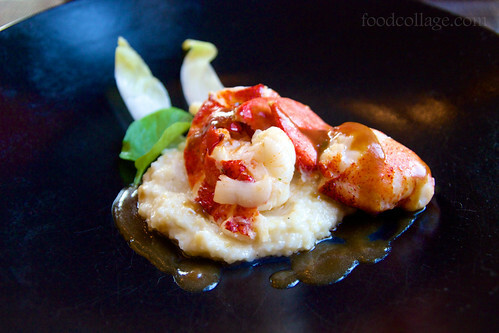 Members also have access to Dinner Lab events in other cities. When a friend learned about Dinner Lab and asked if I wanted to join, I was admittedly hesitant at first. My main concern was that our crazy schedules wouldn't allow for many opportunities to take advantage of the membership, which makes the membership fee difficult to justify. After stalling for a few days, we both decided to take the plunge for a year and see how it goes. 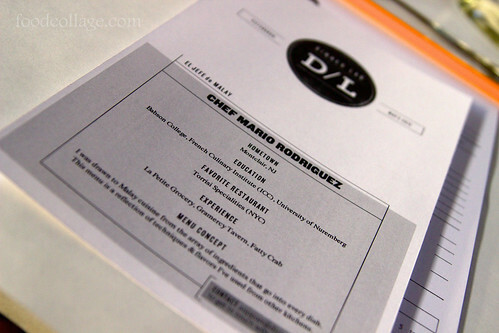 The inaugural Pittsburgh Dinner Lab kicked off May 1-2 with Chef Mario Rodriguez, a.k.a. "El Jefe de Malay" and was held at the vacant Produce Terminal Building in the Strip District—the former home of the Pittsburgh Public Market. R. thought the venue was a bit too informal but I appreciated the opportunity to be back in my old stomping grounds one last time before the building with so much history is torn down forever. 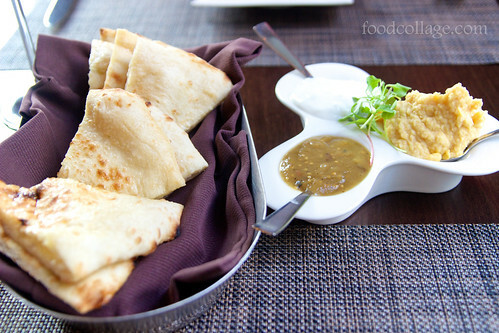 Since I love South Asian food, a meal featuring Malay cuisine was just perfect for me. We arrived promptly at 7:00 pm for drinks, and after a brief introduction of Dinner Lab by Event Manager Kevin Zener, dinner began at 7:30 pm. The 8:00 pm seating arrived at some point during our meal and filled out the other half of the space, but was no interruption to our meal at all. 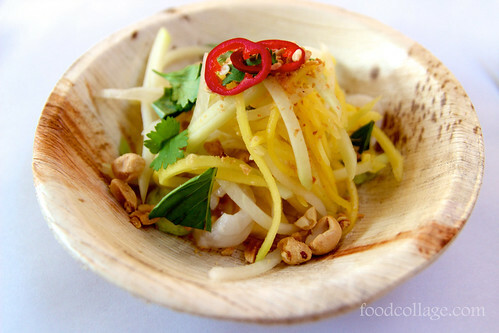 The first course was Green Mango and Lychee Salad served with fried peanuts and cilantro crema. Unfortunately, I was getting over a cold and my sense of smell (and thus taste) was far from 100%, but I still found the salad to be flavorful, refreshing, and interesting. 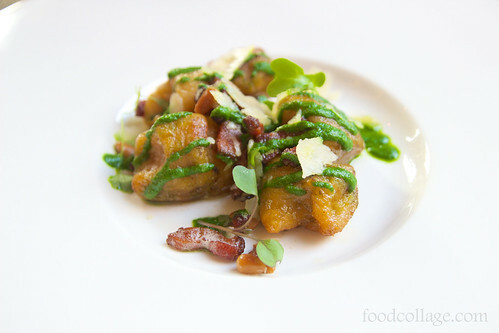 I particularly loved the inclusion of lychee and the contrast with the cilantro crema. I gave this a 4.5 out of 5 rating on taste and 5 on creativity. My only comment was that the mango seemed a little on the bland side to me. I thought perhaps my perception was due to my dampened sense of taste, but R. confirmed he thought the same. 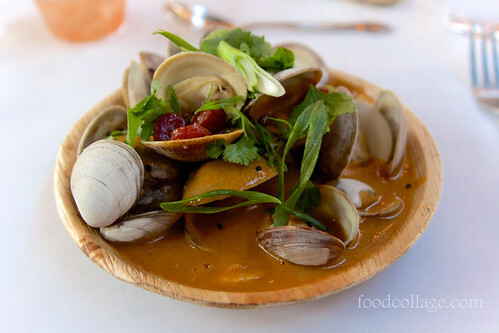 The second course was Red Chili Littleneck Clams served with Chinese sausage, green onion, and a spicy broth. This was a slight change from the originally planned mussels instead of clams, but this worked out nicely for us because R. is not a great fan of mussels and he loved the clams. The broth was chock full of flavor—a bit on the salty side which knocked my rating down to 4.5—but the spices were fantastic. The Chinese sausage ("lap cheong") was a nice touch; I've had it all my life but have certainly never had it with clams. Five out of 5 for creativity! This course was also paired with an Italian sparkling wine (Elmo Pio Asti), though due to my cold, I did not partake. 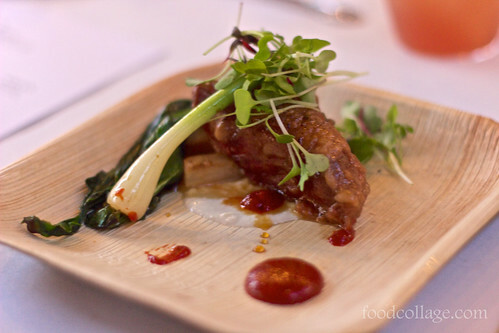 The third course was a surprise change from what was fish stew listed on the original menu to Crispy Fried Duck with turnips, ramps, fresh sriracha, and palm sugar glaze. Interesting combo, for sure, and not bad. The duck meat was cooked to the perfect tenderness, which for me, compensated for some overcooked and dry duck confit I had elsewhere earlier in the week (I won't name the offending restaurant). That said, I felt the duck was too high on saltiness and too low on crispiness. Based on what I remember from a really cool Science of Gastronomy class I took last year, I thought the duck may be better paired with something sweeter to take the edge off the saltiness. Three-and-a-half for taste and 4 for creativity. 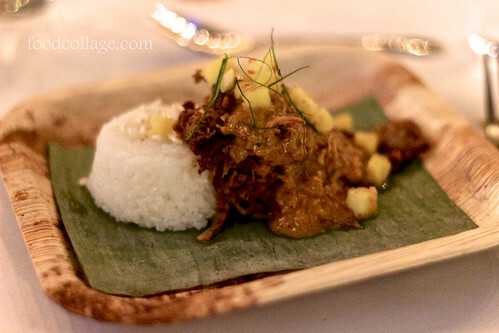 Course number 4, paired with Tsingtao beer from China, was one I initially wasn't sure I'd like: Goat Rendang served with coconut rice, pickled pineapple, and kaffir lime. Surprisingly, it turned out to be the best course yet! You see, I don't like goat, so this isn't something I'd order for myself for sure. But all I could taste was heavily yet perfectly spiced, melt-in-your-mouth savoriness that paired especially well with the slightly sweet coconut rice. It didn't taste..."goaty" to me at all. Granted, maybe it was my half-plugged nose because R. thought there was too much meat flavor, but I was pleasantly surprised by how much I loved this dish. I gave this one a 4.8 for taste and 5 for creativity. 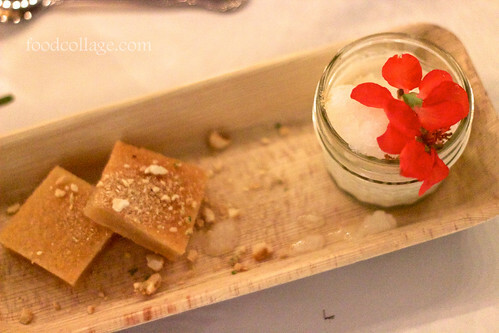 Lastly, but certainly not least: Coconut Panna Cotta with rice cake, ginger granita, and cashew crumble. This, I thought, was the bomb. I know I'm biased—I LOVE coconut, and I LOVE ginger, so put those two together and you pretty much have a winning formula for me. But it was more than just the flavor but also the texture of having the crunchy ginger granita sitting atop the creamy coconut panna cotta. Combining the spicy versus sweet and the crystalline versus rich and the icy versus cool created a sort of heavenly gestalt. This was a slam dunk 5 out of 5 on both taste and creativity. I would be remiss to not mention that the evening was filled with free-flowing alcohol which I sadly had to miss. From what I gather, there were some solid beer options, a number of wine selections, and a specialty cocktail which I did take a sip of and know I would have enjoyed tremendously if I could have imbibed without abandon. 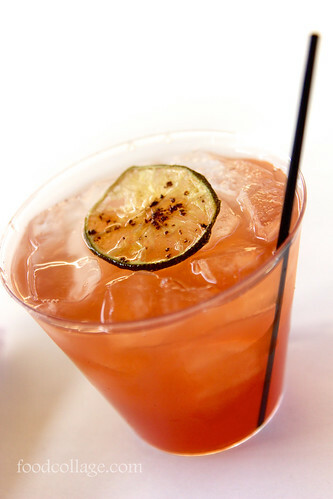 They called it a Japanese Sangria, and according to R. the ingredients included mostly sake, some brandy, pomegranate juice, honey, ginger, and lime. R. also thought the alcohol pairings for Courses 2 and 4 were excellent. I would also be remiss to not commend the waitstaff for their cordiality, expert service, and attentiveness to our needs (especially in the drinks department). The whole night seemed to have run smoothly and flawlessly and I think the fact that the waitstaff made it look so easy was a big part of the success. The communal tables made for a fun, lively atmosphere, and provided a chance to meet some new people. In fact, we discovered that the gentleman sitting next to us did the woodworking at my house when it was being built nearly five years ago, and I had even hired him to help install my kitchen cabinet hardware when I first moved in! Crazy small world, huh? 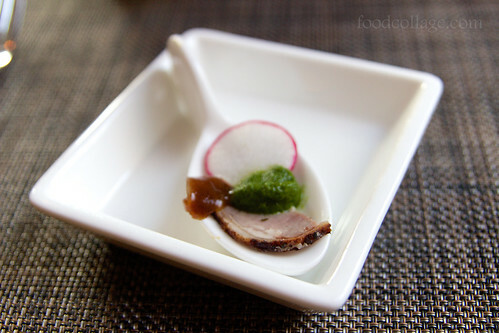 The dishes at these events are unique and likely not to be found at any other place, at least not yet. I am always up for trying things I can't get anywhere else so I love this aspect of the events. Annual membership fee notwithstanding, the per-event price is an incredibly good value when you factor in the food, drinks, tax, gratuities, impeccable service, and pleasant overall experience. Because the chefs get instant feedback from the diners, this is a great opportunity to contribute to the local culinary scene in a positive way, and I love this aspect of being connected to my community. It is also empowering to be able to help shape a budding chef's offerings. As of this writing, there is only one more weekend event scheduled, at the end of May, which I will not be able to attend. The annual membership only makes sense if there are enough opportunities for members to participate. Personally, as I'm sure is the case for many, I have already lost two months because my membership began in March and the first event did not take place until May, and top that off with my busy schedule, there is certainly a part of me that is still wondering if I will be able to take full advantage of my membership. Not only is there only one other weekend with an event scheduled at this point, but it was also sold out within, oh, probably a day would be my guess. I'm thinking there must be members out there who are eager but unable to participate due to the limited opportunity and immense popularity of Dinner Lab. Don't get me wrong—I absolutely love that Pittsburgh has responded so enthusiastically to this new concept. We are certainly upholding our reputation as the "next big thing" food-wise! But, supply must meet demand. Dinner Lab also has a fairly strict cancellation policy in my opinion: You may cancel up to five days before the event, with credit towards a future dinner. I can see the argument that this is more lenient than concerts and sports games, but should one not be able to make an event, the ticket holder to a concert or a sports game can sell or give away the ticket. For Dinner Lab, the member must be the one attending the dinner. In the case of an emergency then, there would be no way out except to forfeit the ticket (along with additional tickets purchased for guests) altogether. Overall, would I recommend Dinner Lab? Right now I lean towards yes, but of course I think it depends. If you're an adventurous eater with few dietary restrictions (some can be accommodated, but it depends on the event) and a flexible schedule, I believe this is a really worthwhile endeavor. I cannot stress how thoroughly I enjoyed my experience last night, and if events are scheduled more frequency, there is a very good chance it will become my next favorite Pittsburgh experience. To sign up or to find out more, go to dinnerlab.com. One more cool thing I want to add about Dinner Lab: Yesterday I received an email with the aggregated ratings of the meal from all diners. DATA! 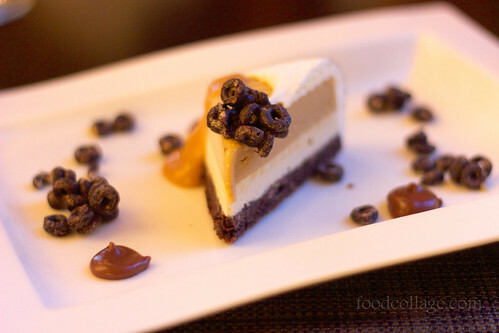 In general, diners overwhelmingly enjoyed each course; almost every course had average ratings well above 4 out of 5. In addition, the overall experience was also highly rated, at approximately 4.8. 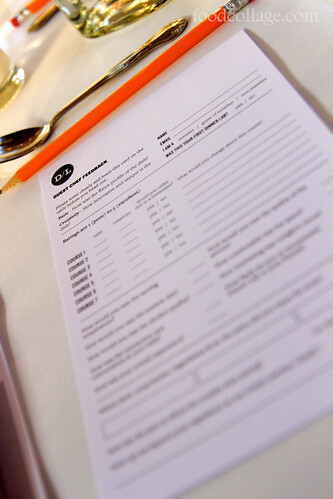 I really love that Dinner Lab kept us informed of the results of the meal, because even if I weren't a data nerd, it made me feel more involved with the experience and that my opinion truly mattered. Finally, it turns out I have this invite link that you can use to join and it will get both you and I $20 credit towards a future event. Check it out if you'd like.